Well, it's Wednesday. That means another outfit post and some more silly thoughts from me. First off, last weekend was wonderful, but this week has already been kicking my you know what. Eric and I are both working late/in class every evening. So I'll see him... this weekend? Blerg. But it's October, everyone's favorite month, and things are pretty "pumpkins everywhere! scarves! excited about the approaching holidays!" around here. I don't know what it is when cool weather finally arrives... everyone is just excited to be alive. Well, until January. January, you are the worst. It finally cooled down enough for me to break out the new booties. Of course, Eric decided to get artsy with the lens flair this week so you can hardly see them in the pictures (loveyousomuch), but let's just say that I am in love. I have been wearing them more than a lot lately. I've been wearing my tan booties like crazy too, and also a striped top with my olive vest...now we just need to wear it all on the same day and we could be twinsies! ;) And you get a big A-men to January being the worst. It being my birth month doesn't even begin to make up for the dreariness. This is a great outfit, I love every bit of it! I'm rocking my booties and loving them today too. And ugh, January. I don't even want to think about January. Great outfit and that dress at old navy is REALLY similar! Crazy. 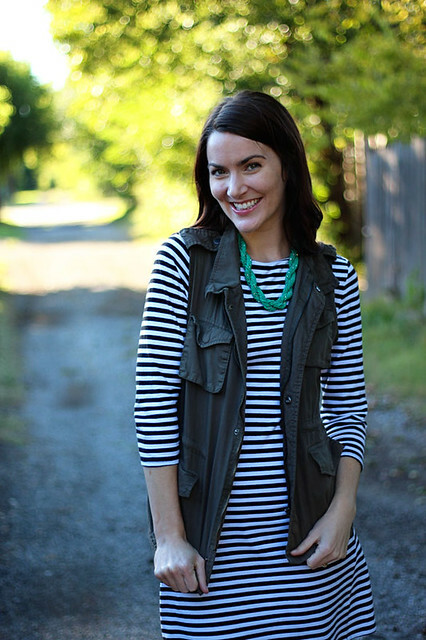 Stripes and military vest is just perfect! Such a great combo! Come and post this on my link up and I'll feature you next week! I'm totally inspired to try my military vest with a dress! Love it! Super cute outfit! I love the layering of vests over a dress or long tee. And love, love booties as well! You look so cute!! 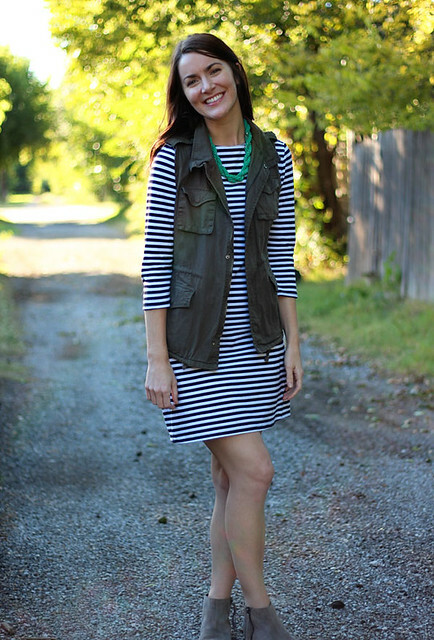 Love the striped dress, and it looks great with the vest. I am super excited about breaking out my booties too. Love them! I love this outfit... most definitely going to be recreating it since I have too many striped dresses and just found (finally!) a military vest. And you're so right about January. Yuck. Love the vest with the dress!! I'm not looking forward to January either! Can't it just be October forever? 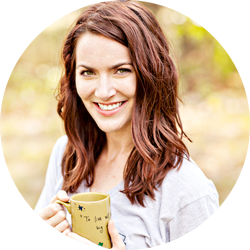 So glad I found your cute blog over at The Pleated Poppy! Love this! And now I need a striped dress. Love your booties! So adorable with that dress! 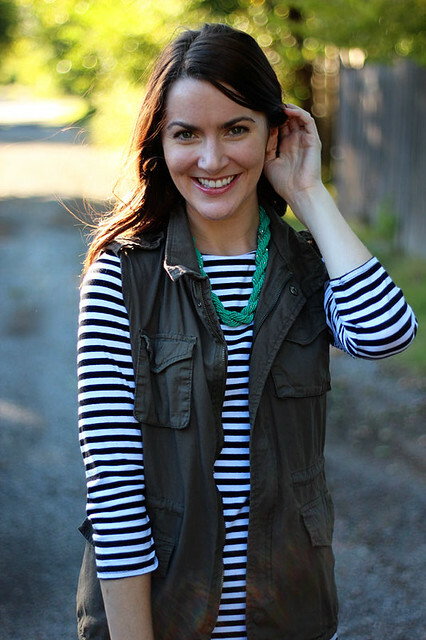 Stripes and military vests = my fave! You look gorgeous as ALWAYS, love! Ditto on October being one of the favorite months =) The coziness, crunchy leaves, & pumpkins are everything~ Love the striped dress & how u paired it with the vest! This is inspiring me to actually wear the vest I picked up at a clothing swap last year. Cute! Great pictures. Love the flair and the heightened anticipation to see the booties in future posts! 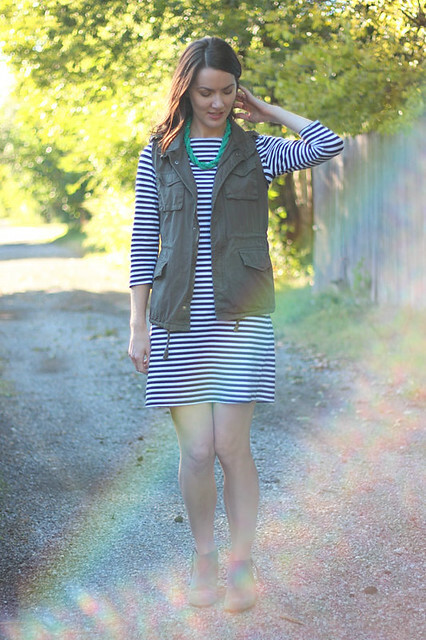 I love the striped dress and vest...they're the perfect combo! I love this outfit! I had even planned to wear one just like it, but then the weather decided it was going to get all cold on us. Pooey. Would you wear your booties with tights? That might just have to happen. Great outfit. Love the dress! And the lens flare does look great, but maybe not so much for an outfit pic :) Hope you get to spend some QT together this weekend! What a nice comfy and cute outfit! I love your booties. Thanks for sharing! 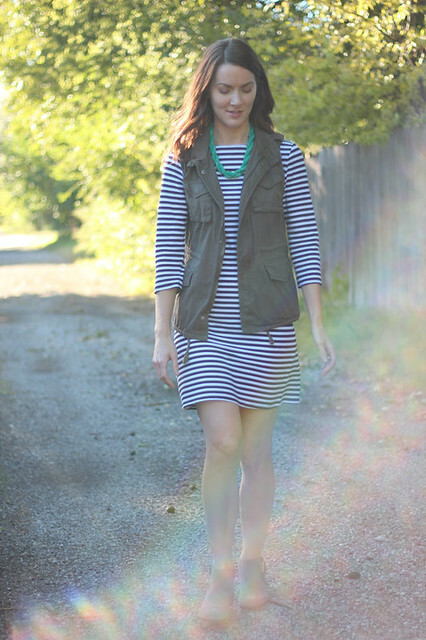 I love stripe dresses and it's wonderful the way you styled this outfit. Such adorable amazing shoes. stripes and military - does it get any better?? you look great!! Ok. I see these booties are getting some great wear! Love the military vest and am on the hunt for something similar. Maybe I will just go for the jacket. It's finally cold enough in Georgia for it!